Can I be totally honest with y’all? I feel like I can. These are the sorts of dresses I draw when I am feeling exhausted and I know I have to get a set done. Is that a bad thing to admit? It’s not that I don’t enjoy drawing them, but they don’t take a lot of mental energy. It’s like safe drawing. There’s not a lot of stretching here. Sometimes though, I do think that is okay. As I said on Monday, the color schemes for all of this week’s outfits are based on previously posted printable paper doll sets. For example, today’s paper doll dress for the B&B series is based on my Pixie series paper doll Malina who was posted in 2014. I have always really loved Malina’s color scheme and I thought it was a fun one to transform into this medieval fantasy dress. Malina is a contemporary fashion paper doll, but I think her color scheme is very universally autumnal. It’s September and it should be chilly and there should be changing leaves. I confess I am getting neither changing leaves nor chilly weather here in Alabama, but I want it! I love the autumn and I want to get to experience some of it, darn it! 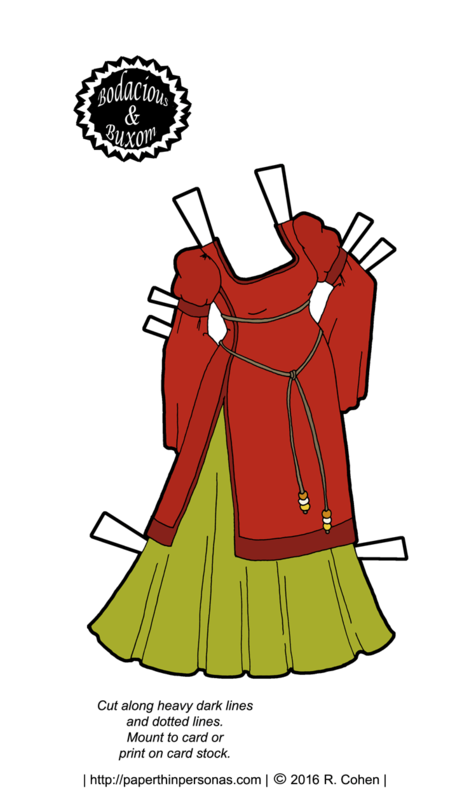 Now, a friendly reminder, you can get the doll that I drew to go with today’s printable paper doll dress from Monday’s post, but feel free to dress up any of the B&B dolls in this fantasy gown. Also, if you like the blog and want to help me keep it online, please consider becoming a Patron. I know I say this a lot, but it really does help me subsidize the server, security and related costs to running PTP. And, of course, I always love to hear what you think about today’s dress.